Whether you’re looking for services to allow for an active, independent life or for a more supported level of care, we offer a full range. 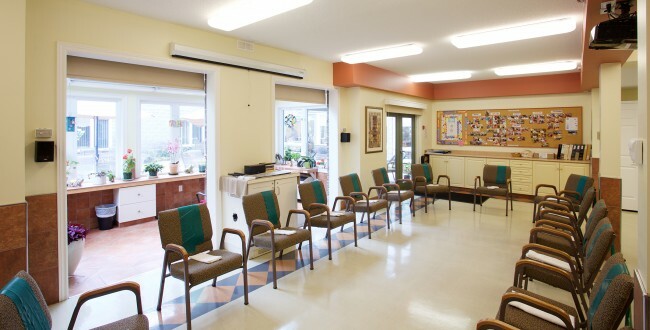 A clean, tidy environment is top priority for the Village Manor. Common areas are kept well maintained and private suites receive weekly housekeeping visits and linen changes. You’ll have a choice from our meal entrees, properly balanced and prepared fresh every day. Three full meals and snacks are served every day and coffee counters are fully accessible and stocked daily. Family and friends are always welcome too. Keeping active in our senior years is vitally important, so we provide the facilities and programming to make it fun and easily accessible. We offer exercise sessions five times per week to improve health and well-being. Village Manor residents enjoy the convenience of a weekly laundry service (including ironing), with pick-up and delivery right to your suite door! All personal laundry is washed individually, folded, ironed and returned on hangers. No labelling required. We work with community agencies, volunteers and churches to meet your entertainment, therapeutic and spiritual needs at the Manor. A nurse is on site 7 days a week, 12 hours per day. All suites are also equipped with a call bell for immediate notification of an emergency. There’s so much benefit in keeping socially and mentally active, so we make spending time together fun and inviting for everyone! Our goals include learning new skills, stimulating the mind, building and maintaining relationships and staying connected. Maintain regular – and easy – access to the larger community with monthly shopping to local retail outlets, library and drugstore Seniors Days. For your pleasure – every day. We also have a great range of amenities for you to enjoy, whenever the mood strikes!